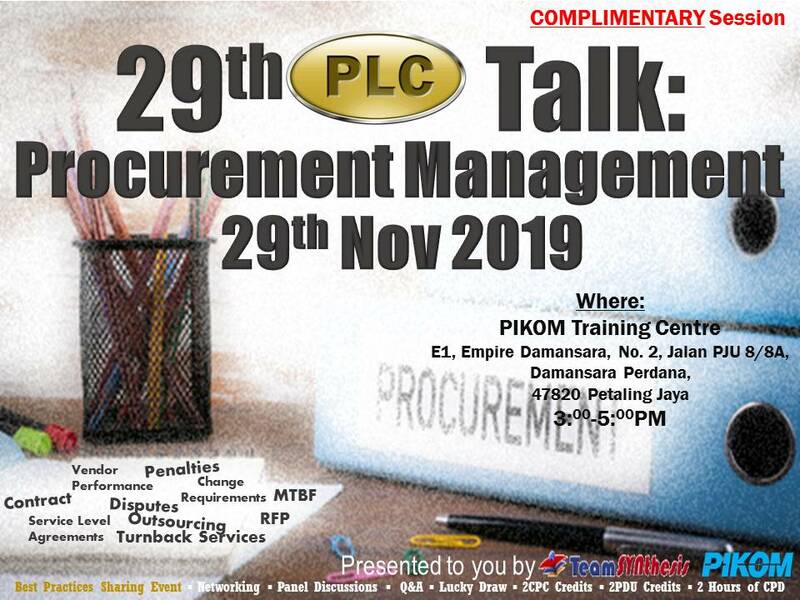 The National ICT Association of Malaysia (PIKOM) in collaboration with Business Technovise Innovation (BTI) is pleased to invite you to attend the 29th PIKOM PowerPM Leadership Course (PLC), a high calibre course in leadership, the most important success differentiator in Pro-gramme / Project Management. 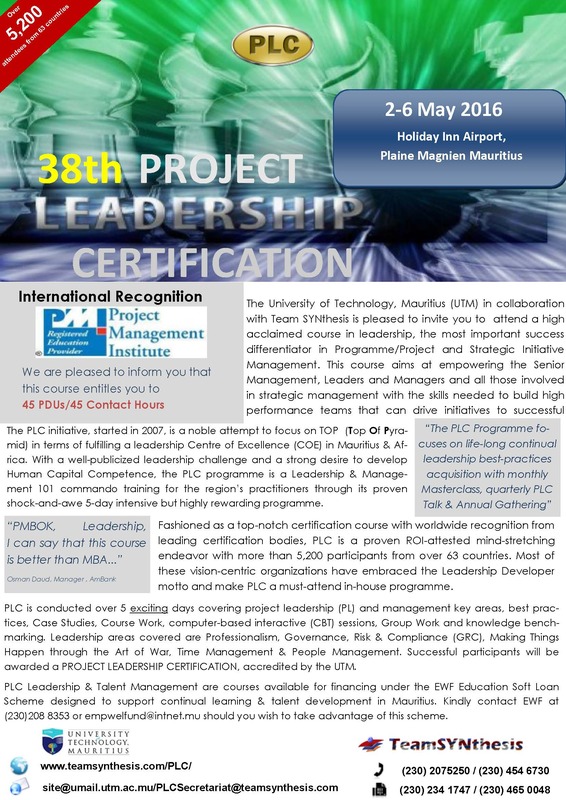 This course aims at empowering the Project Leaders, Portfolio / Programme /Project Managers and all those involved in project management with the skills need-ed to build high performance teams that can drive projects to successful completion and obtain the desired outcome. 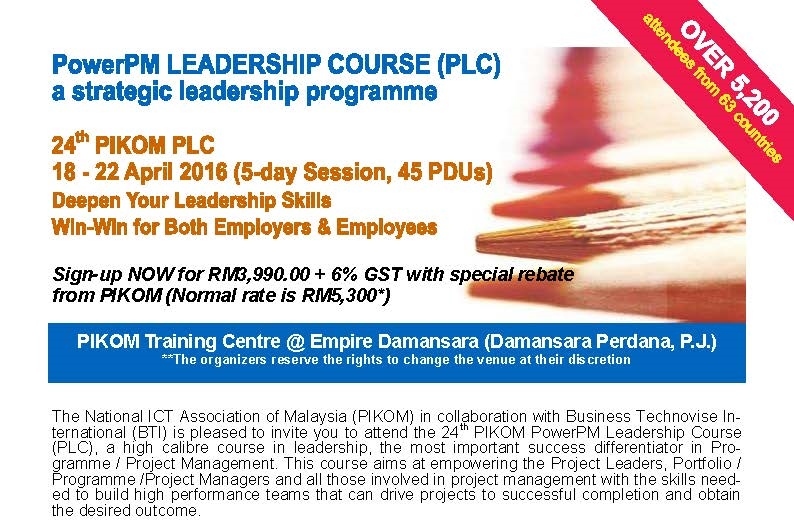 The National ICT Association of Malaysia (PIKOM) in collaboration with Business Technovise Innovation (BTI) is pleased to invite you to attend the 30th PIKOM PowerPM Leadership Course (PLC), a high calibre course in leadership, the most important success differentiator in Pro-gramme / Project Management. This course aims at empowering the Project Leaders, Portfolio / Programme /Project Managers and all those involved in project management with the skills need-ed to build high performance teams that can drive projects to successful completion and obtain the desired outcome. What do organisations need in volatile, fast-moving & customer-driven markets? 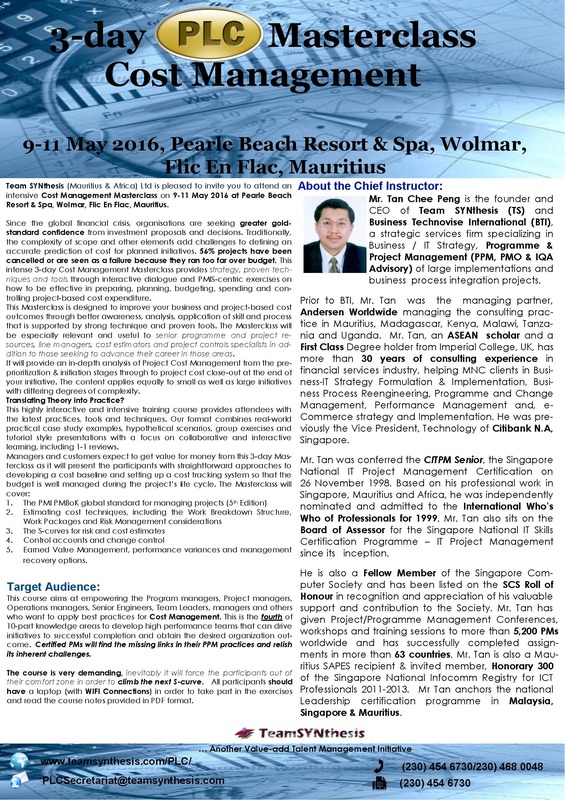 Discover the disruptive changes around the world and their impact to businesses in Mauritius. 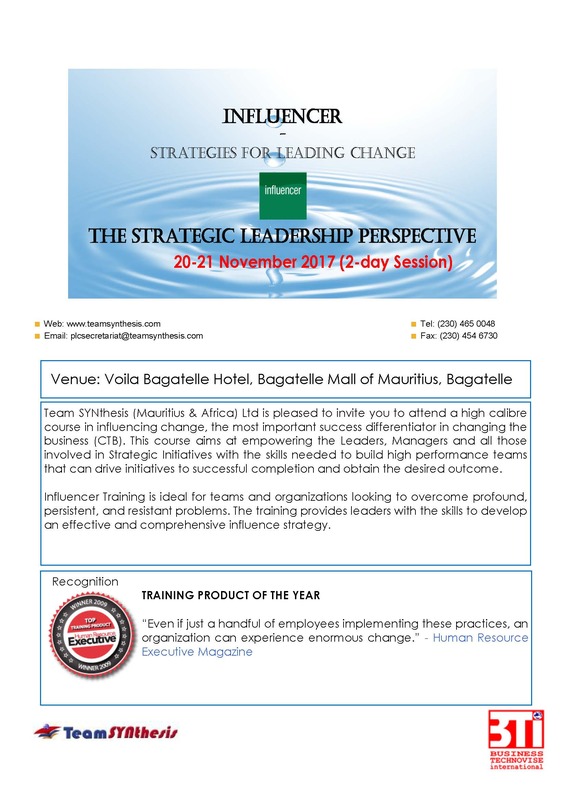 Team SYNthesis (Mauritius & Africa) Ltd is pleased to invite you to attend a high calibre course in influencing change, the most important success differentiator in changing the business (CTB). This course aims at empowering the Leaders, Managers and all those involved in Strategic Initiatives with the skills needed to build high performance teams that can drive initiatives to successful completion and obtain the desired outcome. 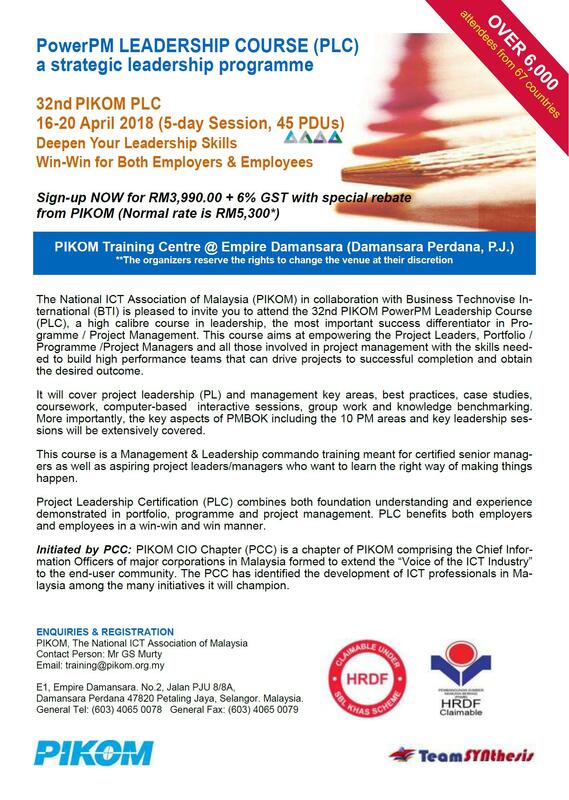 The National ICT Association of Malaysia (PIKOM) in collaboration with Business Technovise Innovation (BTI) is pleased to invite you to attend the 31st PIKOM PowerPM Leadership Course (PLC), a high calibre course in leadership, the most important success differentiator in Pro-gramme / Project Management. This course aims at empowering the Project Leaders, Portfolio / Programme /Project Managers and all those involved in project management with the skills need-ed to build high performance teams that can drive projects to successful completion and obtain the desired outcome. This 2-day class provides the perspective and skills needed to make innovation work in your organisation, in particular business model innovation. 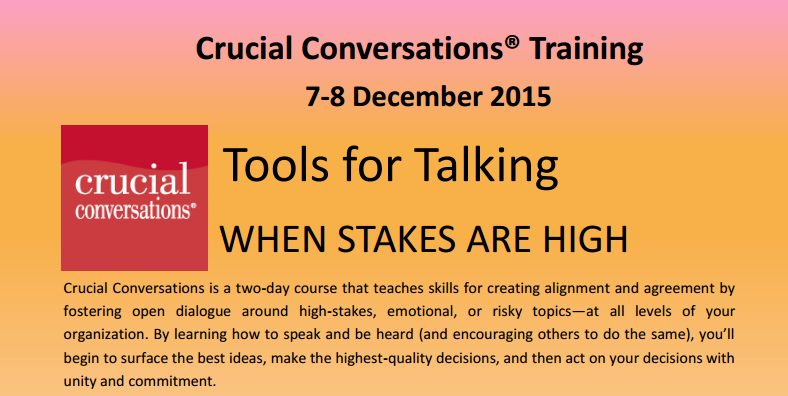 Only about 5% of PMs have ever undergone formal structured training. Even lesser demonstrated the required leadership qualities to make things happen. 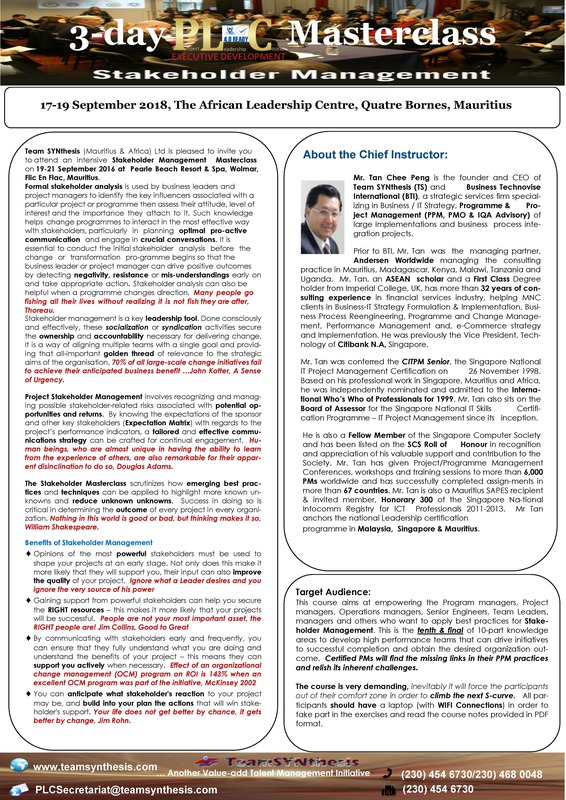 the right vision-to-execution PPM RASCI-defined lifecycle process framework & PPM/PMIS tools. PMs will find the missing links in their PPM practices and relish its inherent challenges. 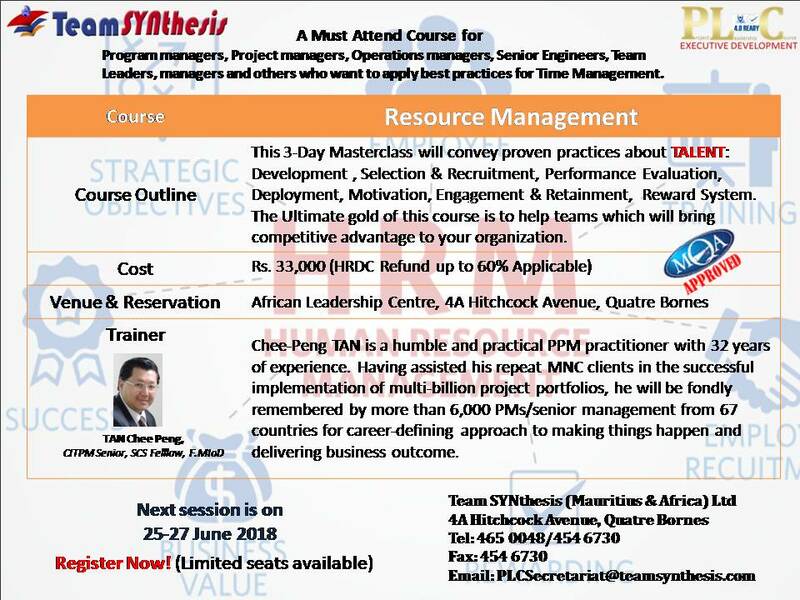 Team SYNthesis (Mauritius & Africa) Ltd is pleased to invite you to attend an intensive Time Management Masterclass on 2-4 April 2018 at The African Leadership Centre, Quatre Bornes, Mauritius. 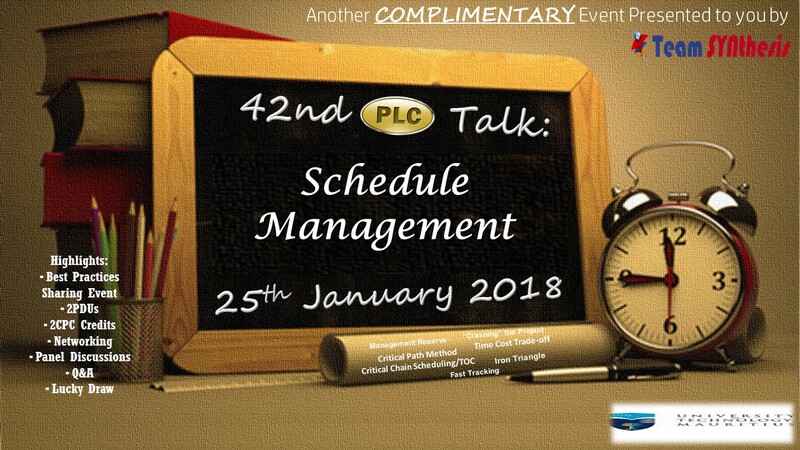 The notion of time management was initially used in business related area but in time the term started to also be used for personal activities. However, not many people are organized, effective and productive enough to avoid the lingering question of sense of accomplishment on a daily basis, hence personal and professional time management becomes intertwined. 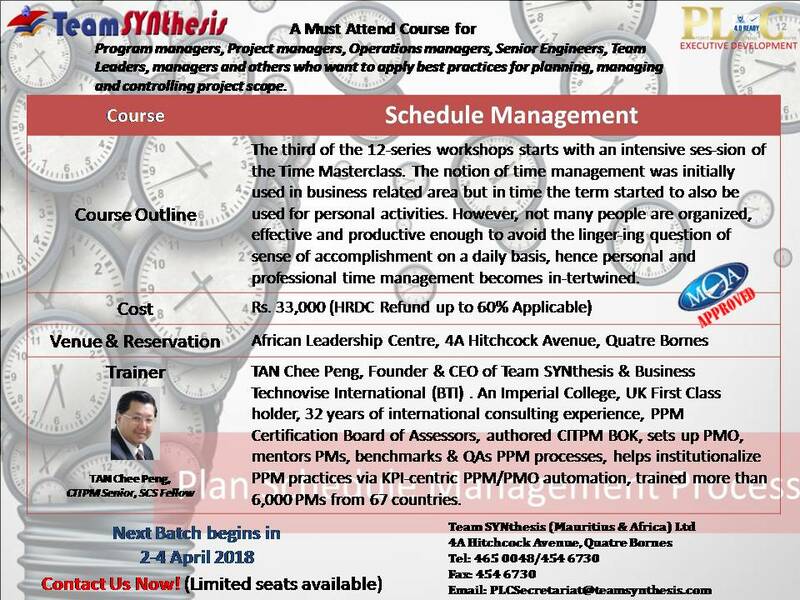 This course aims at empowering the Program managers, Project managers, Operations managers, Senior Engineers, Team Leaders, managers and others who want to apply best practices for Time Management. This is the third of 10-part knowledge areas to develop high performance teams that can drive initiatives to successful completion and obtain the desired organization outcome. Certified PMs will find the missing links in their PPM practices and relish its inherent challenges. 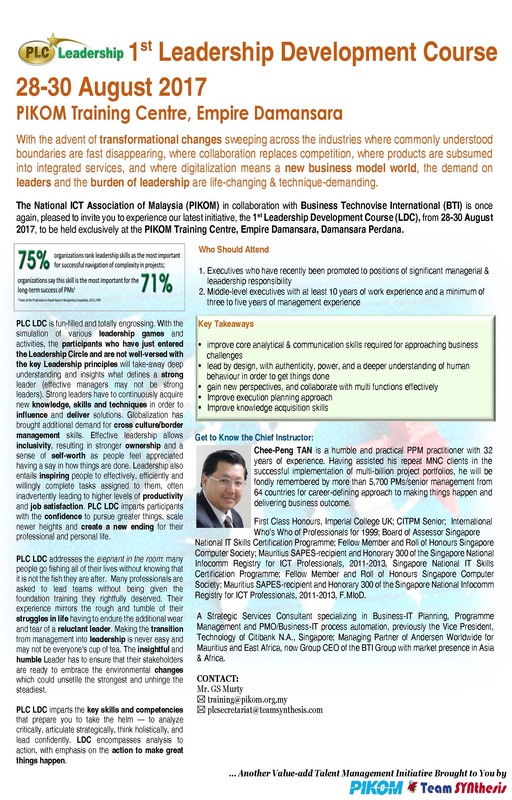 The National ICT Association of Malaysia (PIKOM) in collaboration with Business Technovise Innovation (BTI) is pleased to invite you to attend the 32nd PIKOM PowerPM Leadership Course (PLC), a high calibre course in leadership, the most important success differentiator in Pro-gramme / Project Management. This course aims at empowering the Project Leaders, Portfolio / Programme /Project Managers and all those involved in project management with the skills need-ed to build high performance teams that can drive projects to successful completion and obtain the desired outcome. 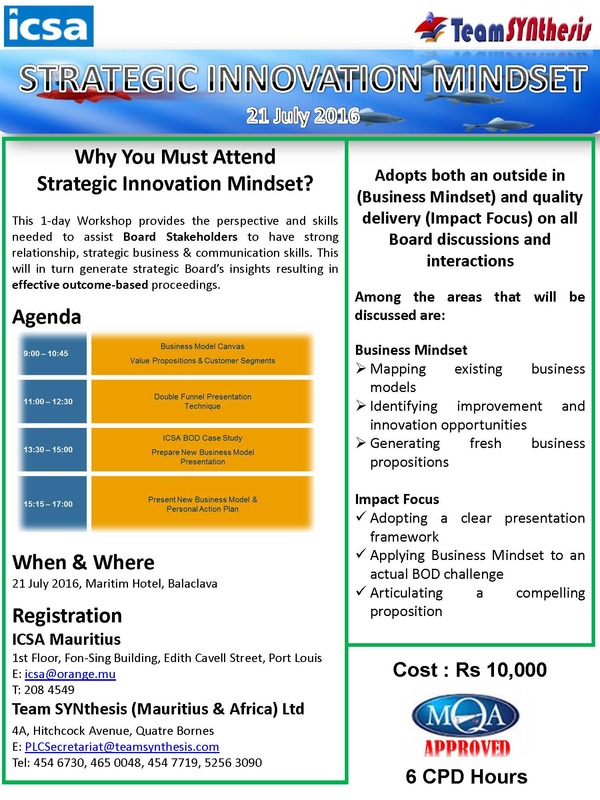 This Masterclass is designed to improve your business and project-based cost outcomes through better awareness, analysis, application of skill and process that is supported by strong technique and proven tools. Since the global financial crisis, organisations are seeking greater goldstandard confidence from investment proposals and decisions. Traditionally, the complexity of scope and other elements add challenges to defining an accurate prediction of cost for planned initiatives. 56% projects have been cancelled or are seen as a failure because they ran too far over budget. 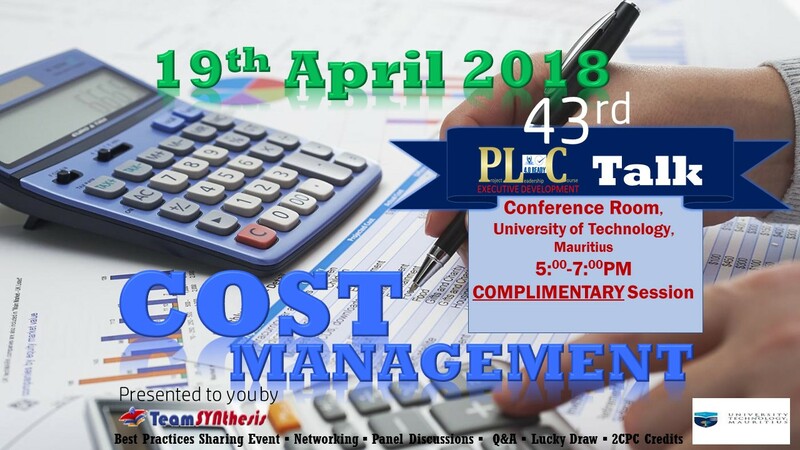 This intense 3-day Cost Management Masterclass provides strategy, proven techniques and tools through interactive dialogue and PMIS-centric exercises on how to be effective in preparing, planning, budgeting, spending and controlling project-based cost expenditure. 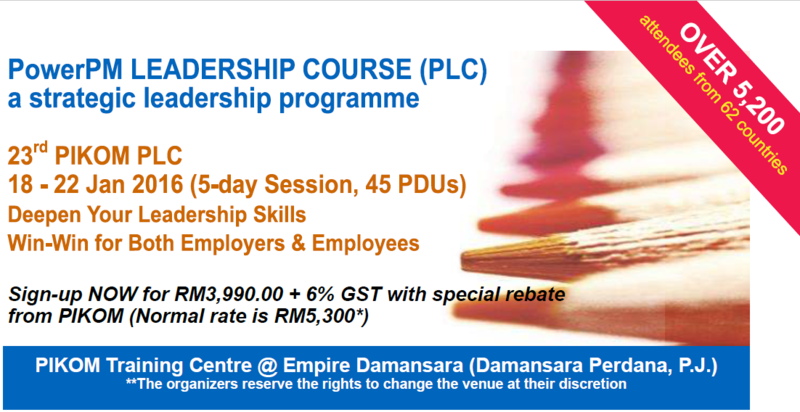 PLC Strategic Development Course (SDC) is a 3-day workshop that will assist you to focus on the future, and lead your team and organization to sustain competitive edge. Strategic management is one of the most important skills in business management. While not having won every war, but having avoided a lot of ambushes, pro-active strategic management means to be on the constant lookout for incremental vs monumental changes. Agile has its own fair share of exponents and opponents, perhaps the issues are in the practitioners and not in its practice? Agile practices provide organisations with a leaner, more structured approach to delivering projects. It enables them to respond far more quickly to change and provides a way to implement high-priority initiatives. To stay effective, businesses need to be able to change quickly. However, the core focus of traditional project delivery methodologies is to thoroughly understand the reasons for change before the change can be enabled; in the real world, this approach can be far too time-consuming. Gartner predicts, by 2016, Business Agility is the key differentiator and motivator in delivering business outcome. While some organisations using Agile development do not have “Project Manager” and put a strong emphasis on self-organising teams, it is nonetheless beneficial for one or more people on the team to have skills in helping the team work more cohesively, communicate more effectively with their stakeholders and support the team with an appropriate level and combination of leadership and guidance, coordination and facilitation. Agile methods are revolutionising the way solutions are being developed. With Agile, solution developers and solution requestors work closely together and the focus is on delivering working solutions frequently, with changes welcomed. Organizations which implement these new approaches successfully will reap the benefits and transform their business landscape. 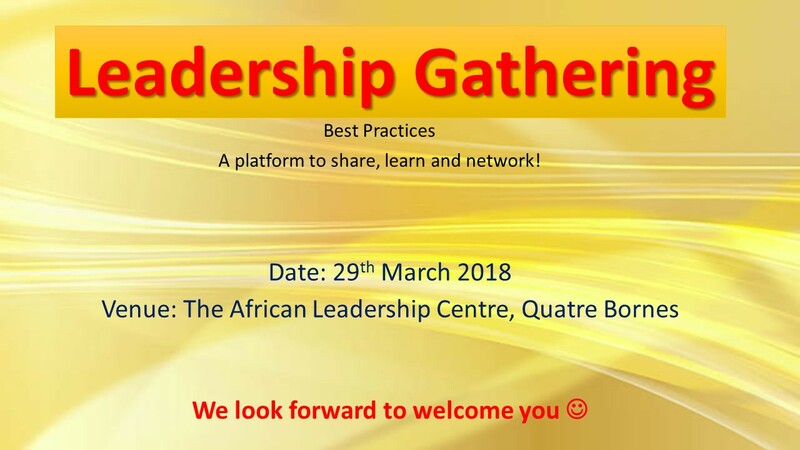 Venue: African Leadership Centre, Quatre Bornes, Mauritius. Learn to interpret and tell the stories behind financial statements and use business drivers and levers to improve performance. The National ICT Association of Malaysia (PIKOM) in collaboration with Business Technovise Innovation (BTI) is pleased to invite you to attend the 33rd PIKOM PowerPM Leadership Course (PLC), a high calibre course in leadership, the most important success differentiator in Pro-gramme / Project Management. This course aims at empowering the Project Leaders, Portfolio / Programme /Project Managers and all those involved in project management with the skills need-ed to build high performance teams that can drive projects to successful completion and obtain the desired outcome. sponsors/stakeholders who the team delivers the project for. Being present, visible and engaged with everyone is IMPORTANT,during the good times and the challenging times. Project Procurement management (Project PM) is the process companies use to purchase economic resources and business input from suppliers or vendors. Approximately $10 trillion is spent annually on projects of all kinds. Globalisation of market and operations, including outsourcing, lead to global purchasing and supplier development. This perspective indicates the importance of effective procurement and supply functions for organisational effectiveness and competitiveness. Project procurement management is the process of purchasing the products necessary for meeting the needs of the project scope. It is favorable that the goods, services or works are appropriate and that they are procured at the best possible to meet the needs of the purchaser in terms of quality and quantity, time, and location. Particularly in the current economic environment, effective and efficient procurement across your business is vital. As Paul Teague puts it aptly, data analytics are being harnessed by just about everyone, it’s time procurement become the master. Formal stakeholder analysis is used by business leaders and project managers to identify the key influencers associated with a particular project or programme then assess their attitude, level of interest and the importance they attach to it. 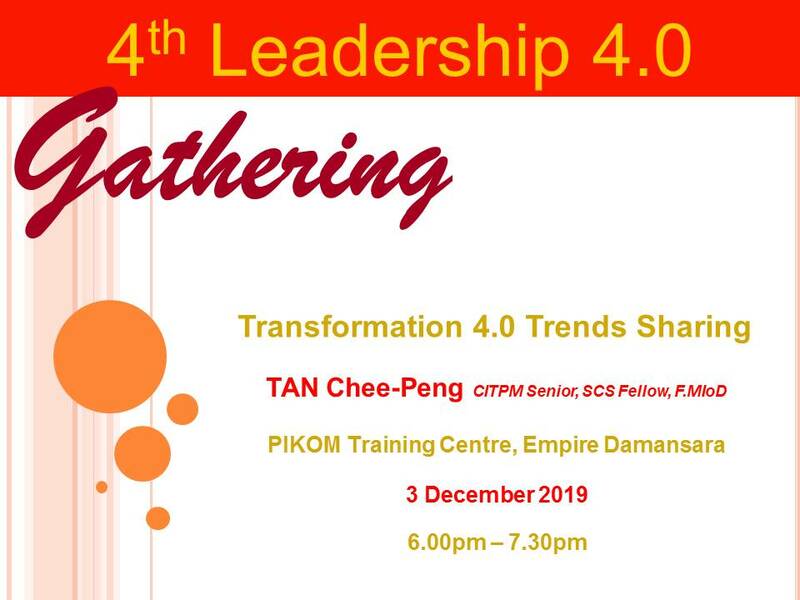 The National ICT Association of Malaysia (PIKOM) in collaboration with Business Technovise Innovation (BTI) is pleased to invite you to attend the 34th PIKOM PowerPM Leadership Course (PLC), a high calibre course in leadership, the most important success differentiator in Pro-gramme / Project Management. This course aims at empowering the Project Leaders, Portfolio / Programme /Project Managers and all those involved in project management with the skills need-ed to build high performance teams that can drive projects to successful completion and obtain the desired outcome. Project management develops and implements plans to achieve a specific scope that is driven by the objectives s of the program or the portfolio to which it is subjected and, ultimately, to organizational strategies. A project can be completed on schedule, within budget but still not delivering the intended business outcome. 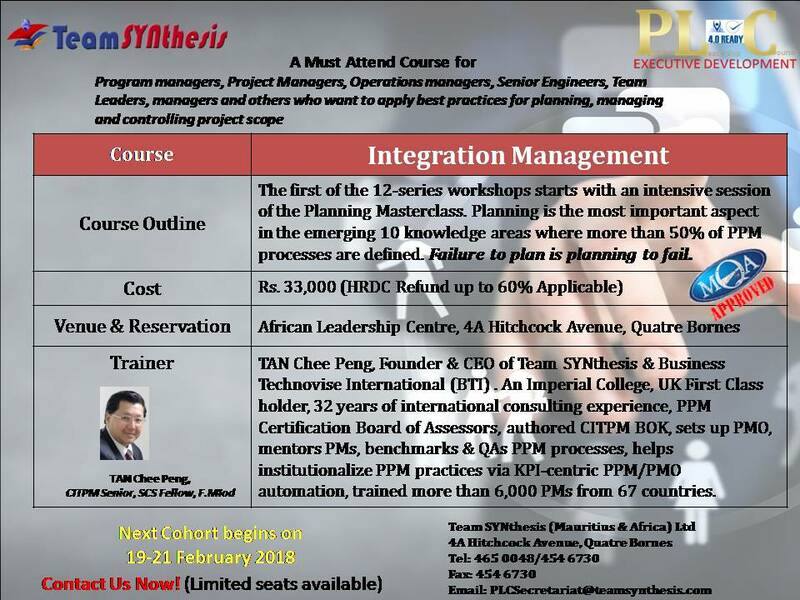 Thus, the Project Simulation (Intermediate) PPM Masterclass serves to demonstrate through practical applications the most important success differentiators in Programme/Project and Strategic Initiative management. 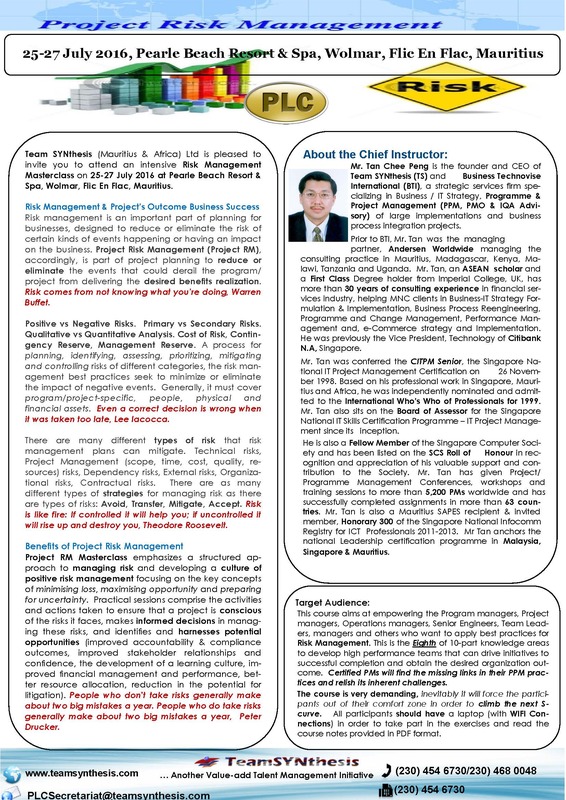 Highly-driven by PMIS, the critical scenarios, including aspects of the 10 knowledge areas, technical performance and project accounting datapoints, are emphasized to address the missing links in many projects. Without these key elements, the project managers may not be guided properly in driving the projects to a successful conclusion. 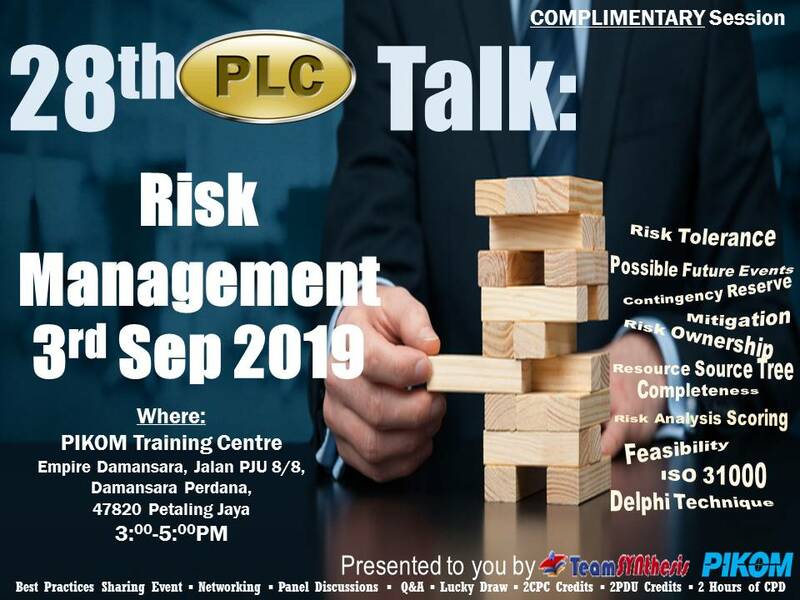 Moreover, you would benefit from the practical case studies where you may apply the lessons learned in your real-life projects, hence enriching your PPM experiential values and ensuring your organization receives the best-inclass solutions. 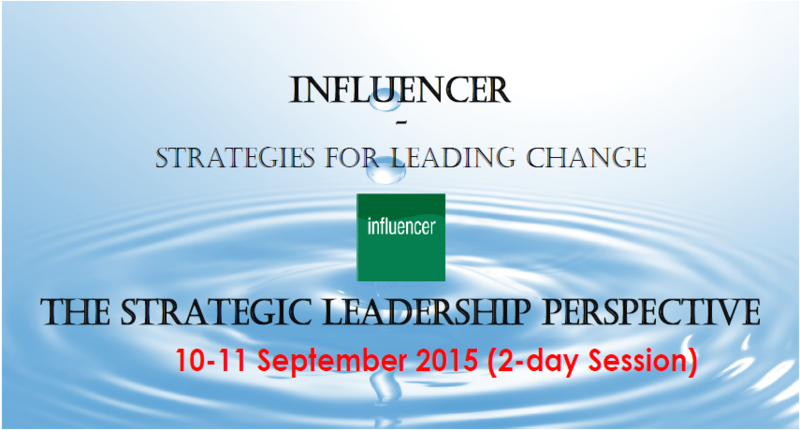 Project leadership is a potent combination of strategy and character. But if you must be without one, be without strategy, as culture eats strategy for breakfast everyday! 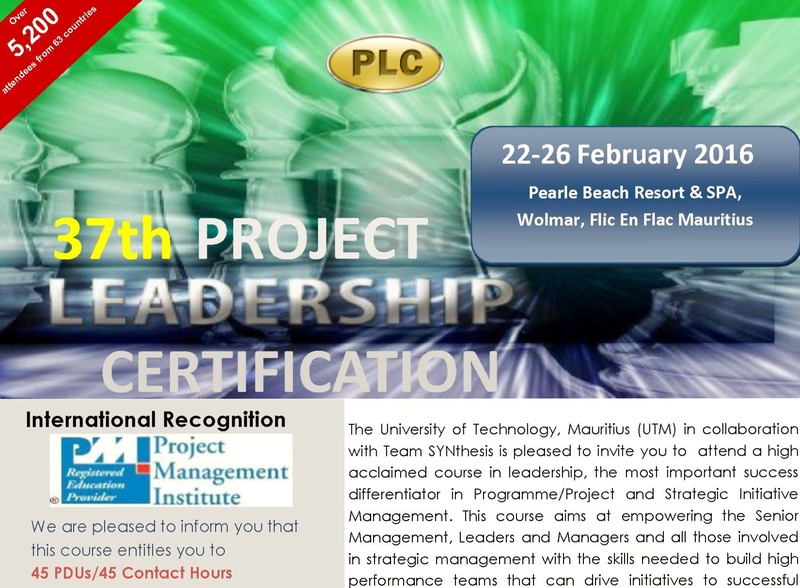 Team SYNthesis (Mauritius & Africa) Ltd is pleased to invite you to participate in one of our latest addition to the PLC Suite – the Project Leadership Course (PLC) Leadership – from 12-14 December 2018 at the African Leadership Centre in Quatre Bones, Mauritius. 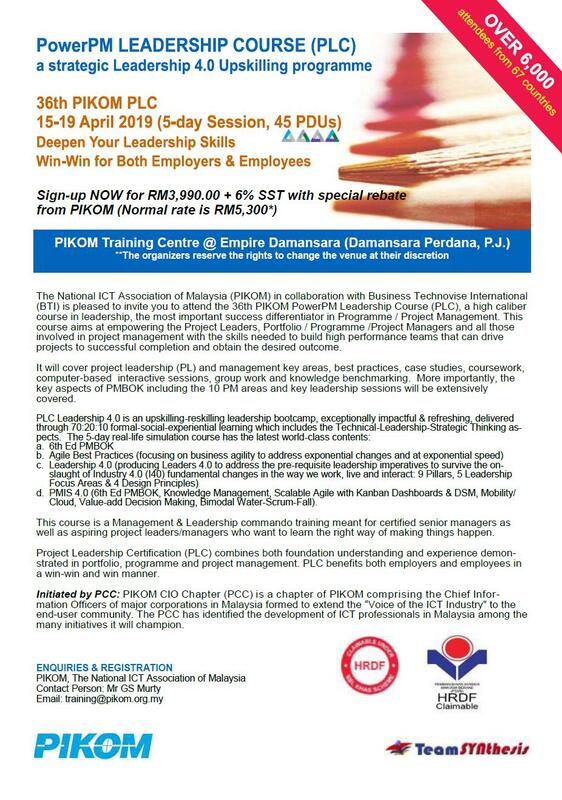 The National ICT Association of Malaysia (PIKOM) in collaboration with Business Technovise Innovation (BTI) is pleased to invite you to attend the 36th PIKOM PowerPM Leadership Course (PLC), a high calibre course in leadership, the most important success differentiator in Pro-gramme / Project Management. This course aims at empowering the Project Leaders, Portfolio / Programme /Project Managers and all those involved in project management with the skills need-ed to build high performance teams that can drive projects to successful completion and obtain the desired outcome. The National ICT Association of Malaysia (PIKOM) in collaboration with Business Technovise Innovation (BTI) is pleased to invite you to attend the 37th PIKOM PowerPM Leadership Course (PLC), a high calibre course in leadership, the most important success differentiator in Pro-gramme / Project Management. This course aims at empowering the Project Leaders, Portfolio / Programme /Project Managers and all those involved in project management with the skills need-ed to build high performance teams that can drive projects to successful completion and obtain the desired outcome. The National ICT Association of Malaysia (PIKOM) in collaboration with Business Technovise Innovation (BTI) is pleased to invite you to attend the 38th PIKOM PowerPM Leadership Course (PLC), a high calibre course in leadership, the most important success differentiator in Pro-gramme / Project Management. This course aims at empowering the Project Leaders, Portfolio / Programme /Project Managers and all those involved in project management with the skills need-ed to build high performance teams that can drive projects to successful completion and obtain the desired outcome. 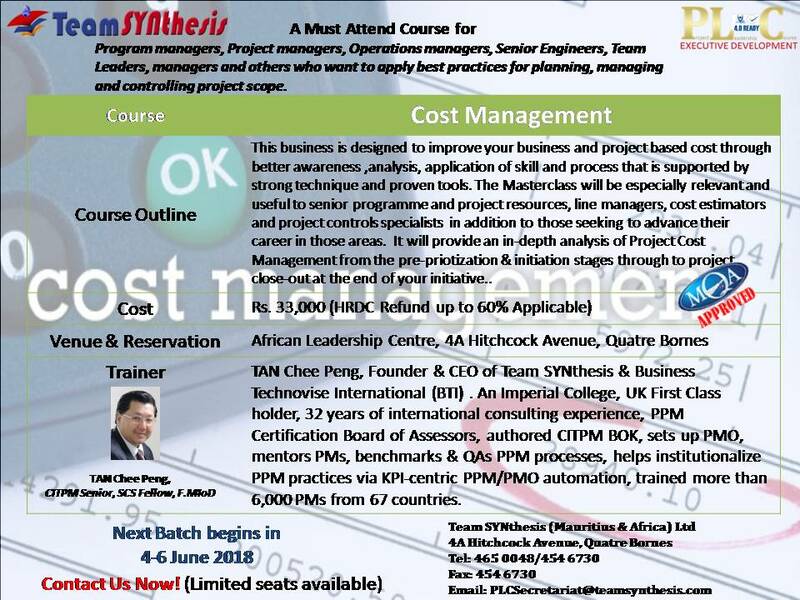 It will cover project leadership (PL) and management key areas, best practices, case studies, coursework, computer-based interactive sessions, group work and knowledge benchmarking. More importantly, the key aspects of PMBOK including the 10 PM areas and key leadership sessions will be extensively covered. 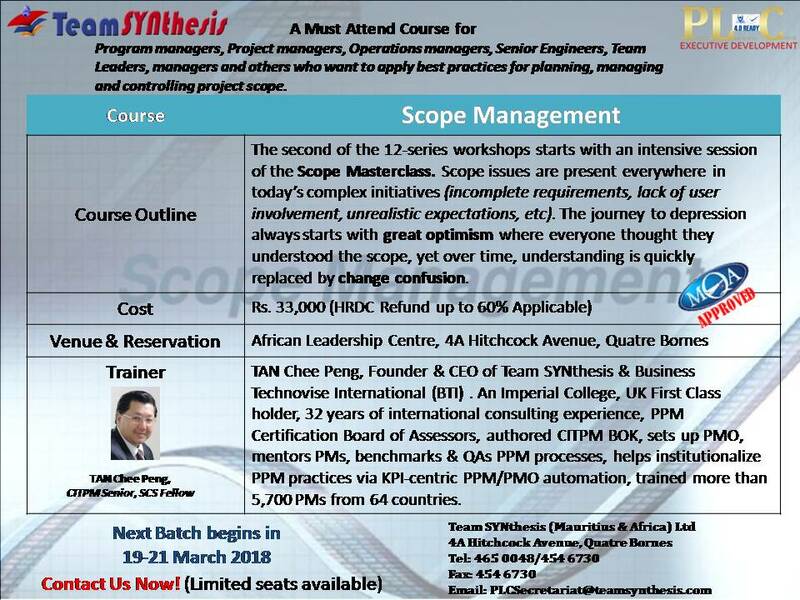 This course is a Management & Leadership commando training meant for certified senior managers as well as aspiring project leaders/managers who want to learn the right way of making things happen. 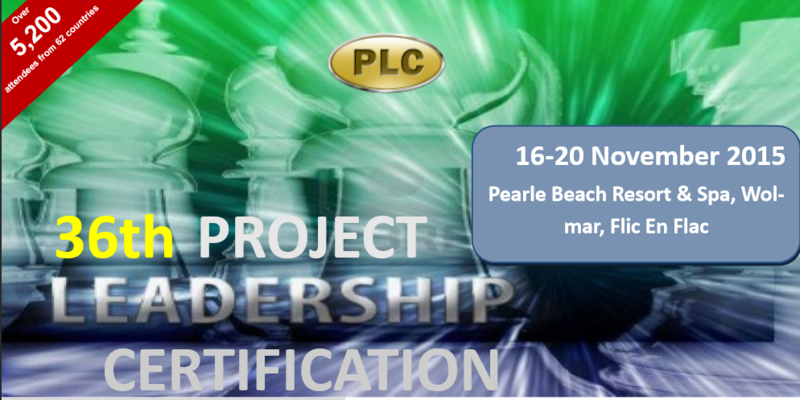 This course aims at empowering the Project Leaders, Portfolio / Programme /Project Managers and all those involved in project management with the skills needed to build high performance teams that can drive projects to successful completion and obtain the desired outcome. 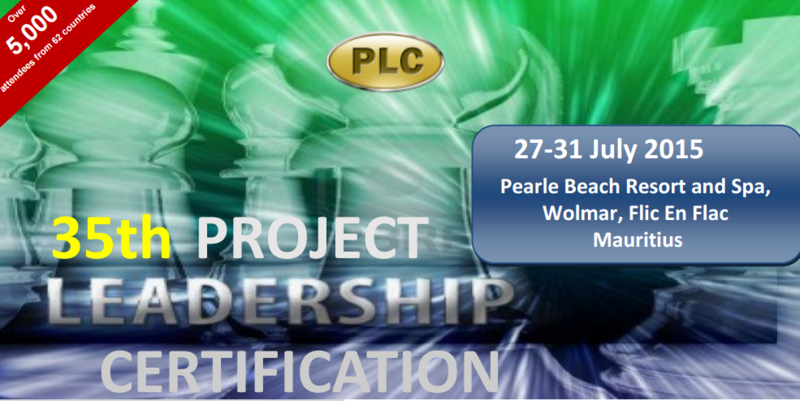 Project Leadership Certification (PLC) combines both foundation understanding and experience demonstrated in portfolio, programme and project management. 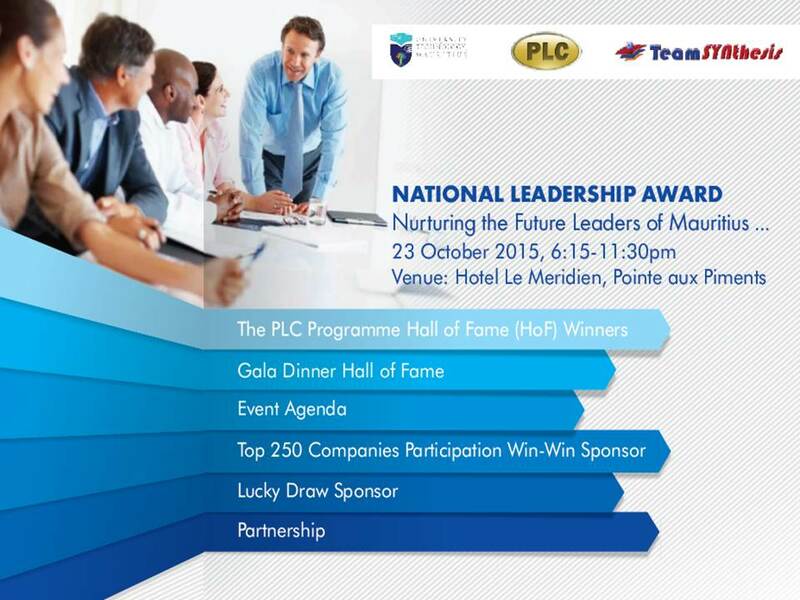 PLC benefits both employers and employees in a win-win and win manner. 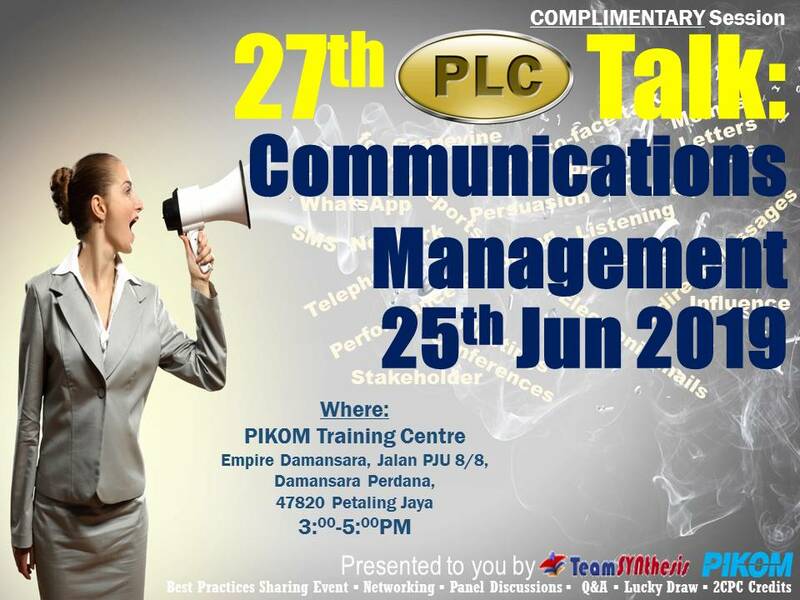 Initiated by PCC:PIKOM CIO Chapter (PCC) is a chapter of PIKOM comprising the Chief Information Officers of major corporations in Malaysia formed to extend the “Voice of the ICT Industry” to the end-user community. 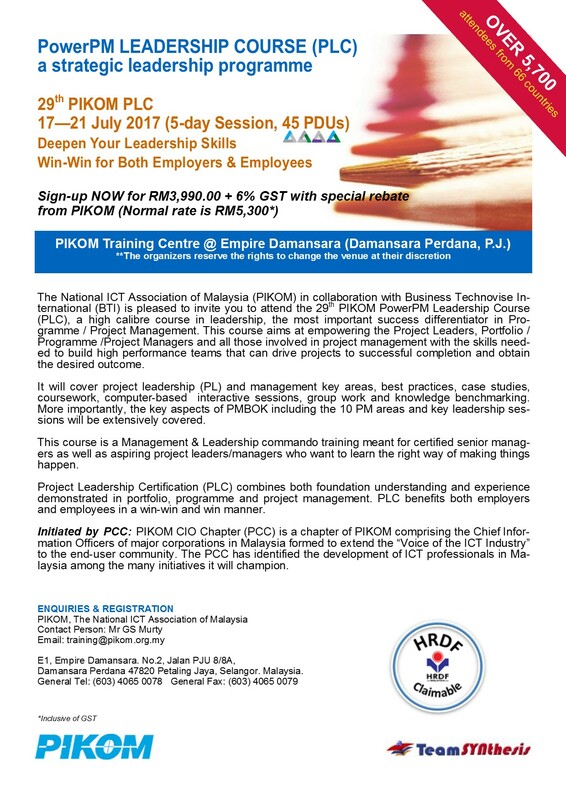 The PCC has identified the development of ICT professionals in Malaysia among the many initiatives it will champion. Participants using this approach are able to achieve more in less time and at the same time they go both deeper and broader into matters, which they are working through and strategizing on. The three quotes captured essential benefits from using LEGO® Serious Play® (LSP) approach. These quotes were from three strategizing workshops, but the additional outcome was that they built stronger teams. 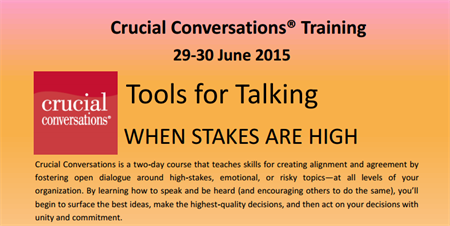 This 2-day class LSP methodology is a facilitated meeting, communication and problem solving method, where participants are led through a series of questions, which go deeper and deeper. 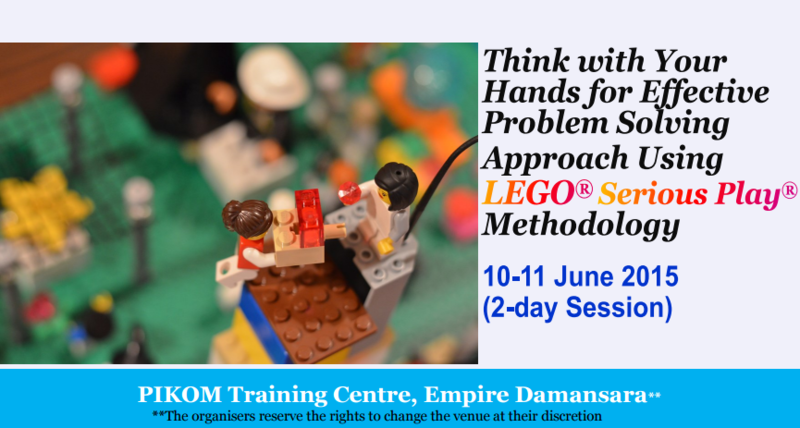 Participants will build their own 3D LEGO® models in response to the facilitator’s questions using the LEGO® bricks provided. It will then be used as the platform for group discussion, knowledge sharing, problem solving and decision-making. 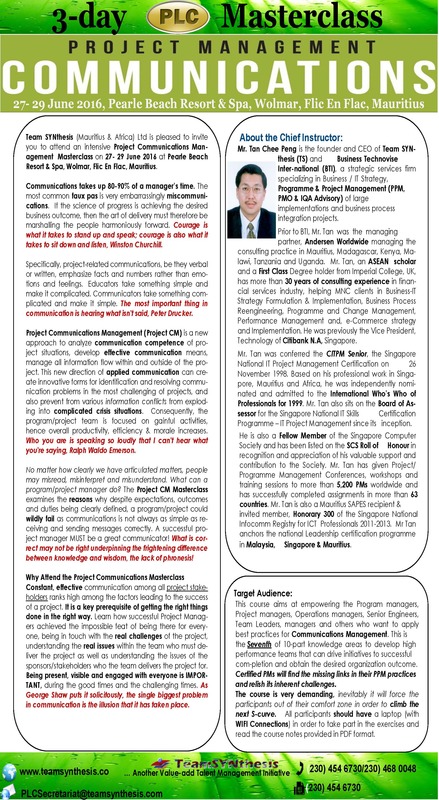 Project Communications Management (Project CM) is a new approach to analyze communication competence of project situations, develop effective communication means, manage all information flow within and outside of the project. 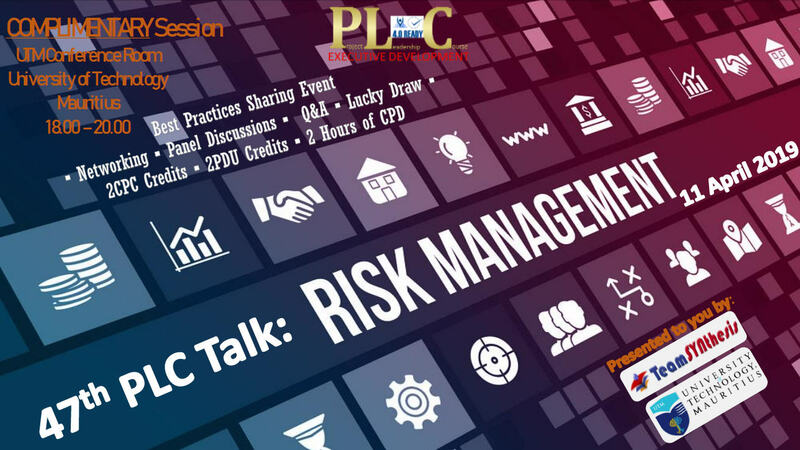 Risk management is an important part of planning for businesses, designed to reduce or eliminate the risk of certain kinds of events happening or having an impact on the business. The Project Leadership Certification course, the first of its kind in Mauritius and the African Region, is anchored by Mr. TAN Chee Peng, CEO of Business Technovise International (represented in Mauritius by Team SYNthesis Mauritius &amp;amp;amp;amp; Africa) Ltd). 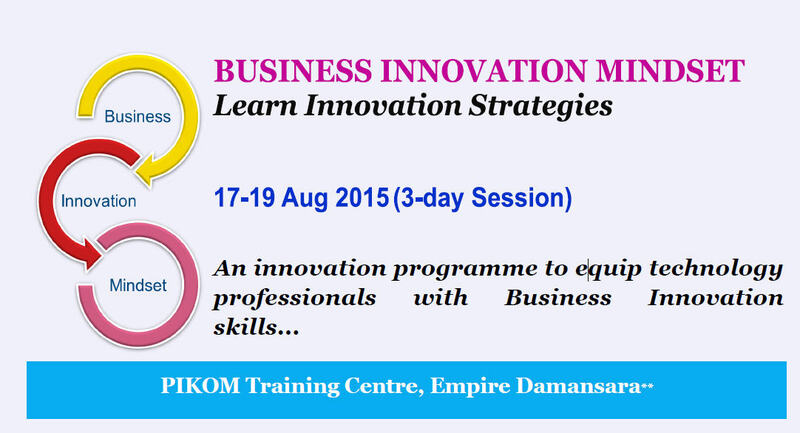 This 3-day class provides the perspective and skills needed to make innovation work in your organisation, in particular business model innovation. Based on the most widely used andvisually effective business model canvas, you will learn how to use a new, holistic lens to understand, define and more importantly redefine your organisation’s business. This is the skill that will earn you a place at the strategy table and set you apart from the others. 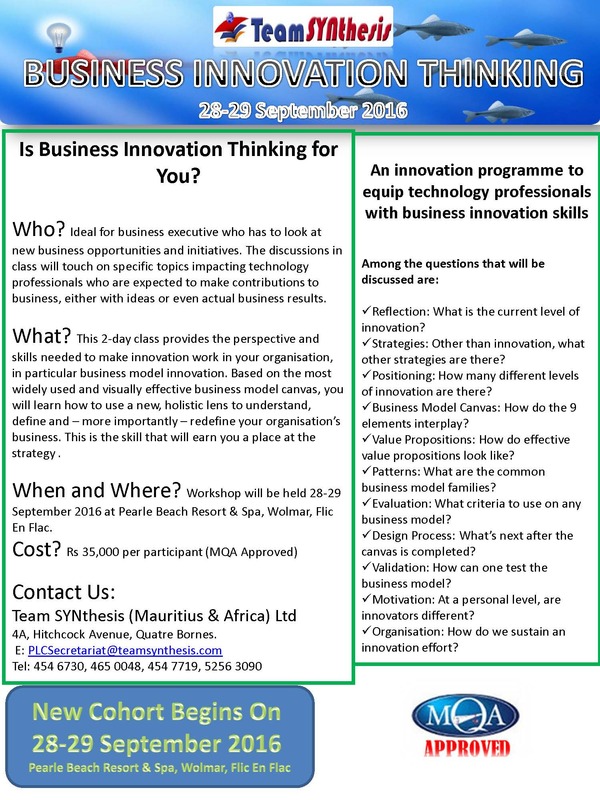 This course is for the technology professional and business executive who has to look at new business opportunities and initiatives. The discussions in class will touch on specific topics impacting technology professionals who are expected to make contributions to business, either with ideas or even actual business results. 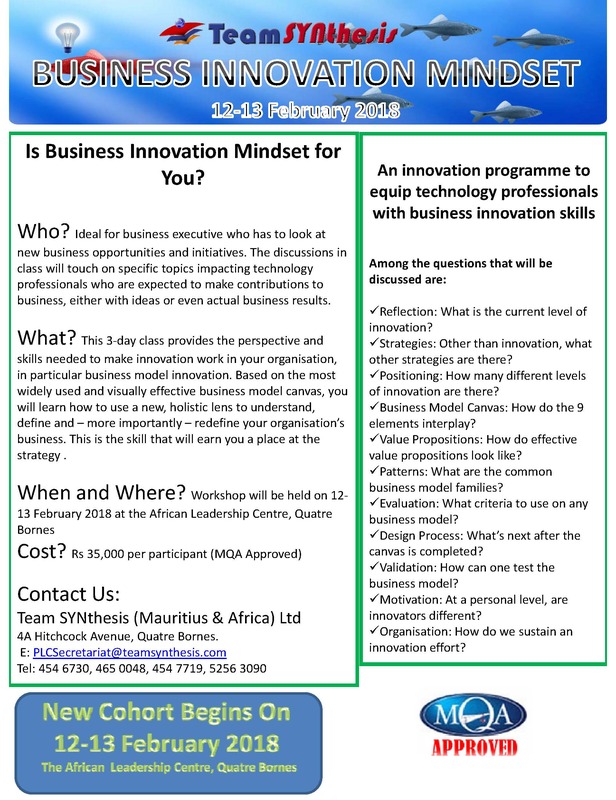 This 2-day class provides the perspective and skills needed to make innovation work in your organisation, in particular business model innovation. Based on the most widely used and visually effective business model canvas, you will learn how to use a new, holistic lens to understand, define and –more importantly –redefine your organisation’s business. This is the skill that will earn you a place at the strategy . 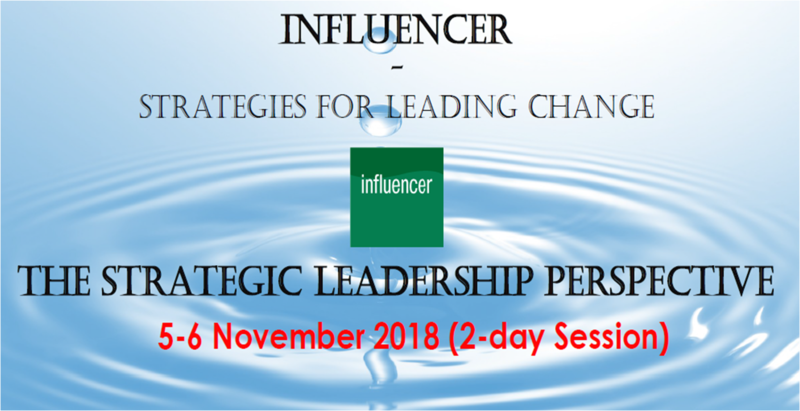 Influencer Training provides proven strategies for leaders to uproot entrenched habits and execute change initiatives in teams and entire organizations. The truth is, we all need to be better influencers. Hardly a day passes that we do not try to influence ourselves or others to do something different. We do our best to motivate employees to demonstrate more concern for profitability. We struggle to enable our teams to complete projects on time and on budget. In summary, we continually work on ways to exert our influence, but we regularly fall short. In fact, in spite of the fact that we are routinely trying to help ourselves and others alter behavior, few of us can articulate a model of what it takes to do so. It is time this changed. Formal stakeholder analysis is used by business leaders and projectmanagers to identify the key influencers associated with a particular project or programme then assess their attitude, level of interest and the importance they attach to it. 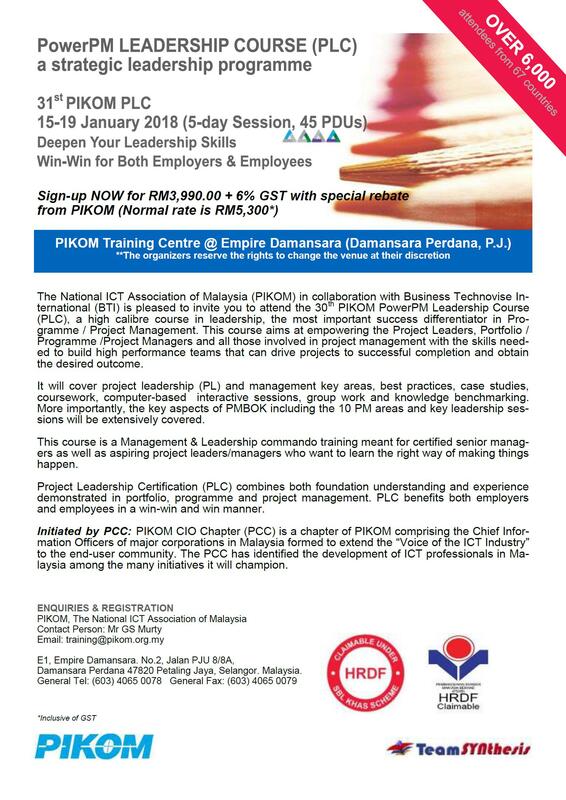 Initiated by PCC: PIKOM CIO Chapter (PCC) is a chapter of PIKOM comprising the Chief Information Officers of major corporations in Malaysia formed to extend the “Voice of the ICT Industry” to the end-user community. 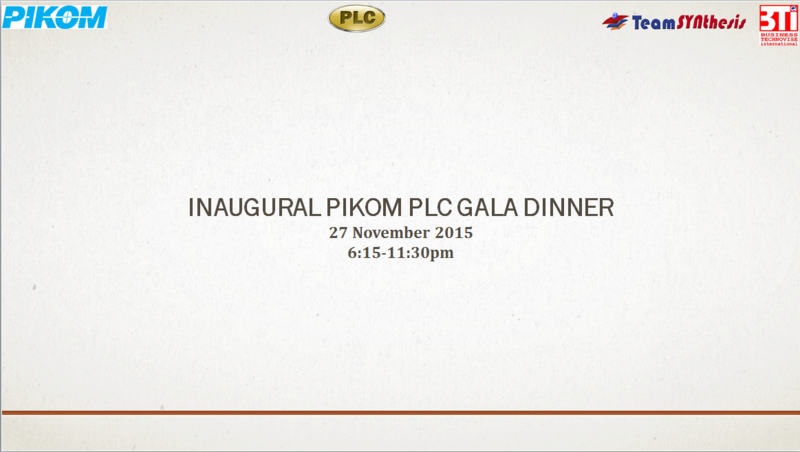 The PCC has identified the development of ICT professionals in Malaysia among the many initiatives it will champion. Crucial Conversations is a two-day course that teaches skills for creating alignment and agreement by fostering open dialogue around high-stakes, emotional, or risky topics—at all levels of your organization. 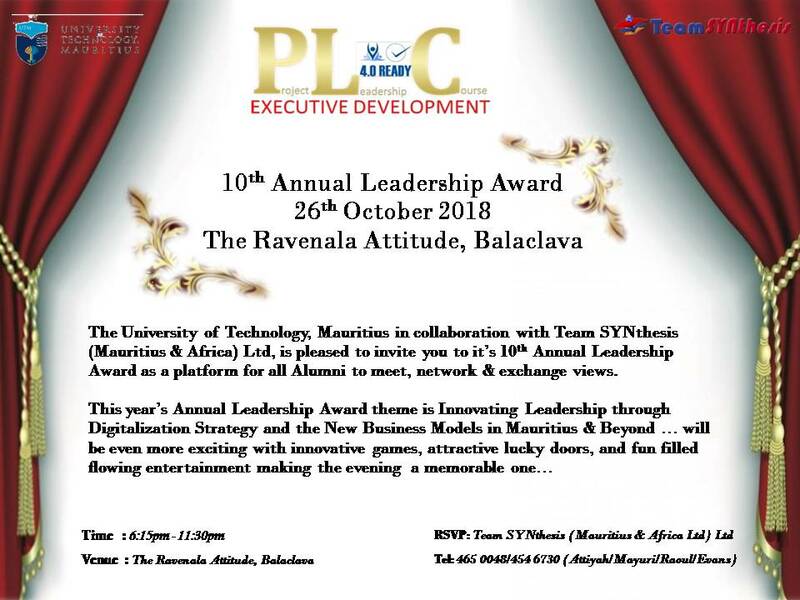 The outcome of this event is for us to instill innovative & collaborative leadership in transforming Good business and operations to Great, an essential pre-requisite in the Mauritius African Growth Journey. We will be greatly honored by your presence, our sincere appreciation in advance for your invaluable time in participating in the 2015 Leadership Gala Dinner and making this annual event an even memorable one. Approximately $10 trillion is spent annually on projects of all kinds. Globalisation of market and operations, including outsourcing, lead to global purchasing and supplier development. This perspective indicates the importance of effective procurement and supply functions for organisational effectiveness and competitiveness. Project procurement management is the process of purchasing the products necessary for meeting the needs of the project scope. It is favorable that the goods, services or works are appropriate and that they are procured at the best possible to meet the needs of the purchaser in terms of quality and quantity, time, and location. Particularly in the current economic environment, effective and efficient procurement across your business is vital. As Paul Teague puts it aptly, data analytics are being harnessed by just about everyone, it’s time procurement become the master. Project Procurement management (Project PM) is the process companies use to purchase economic resources and business input from suppliers or vendors. Procurement planning is the process of identifying which part of the project should be procured from resources outside of the organization. Generally, procurement decisions are made early on in the planning processes. At the end, a company’s procurement experience and knowledge needs to be highly relevant to the local markets. 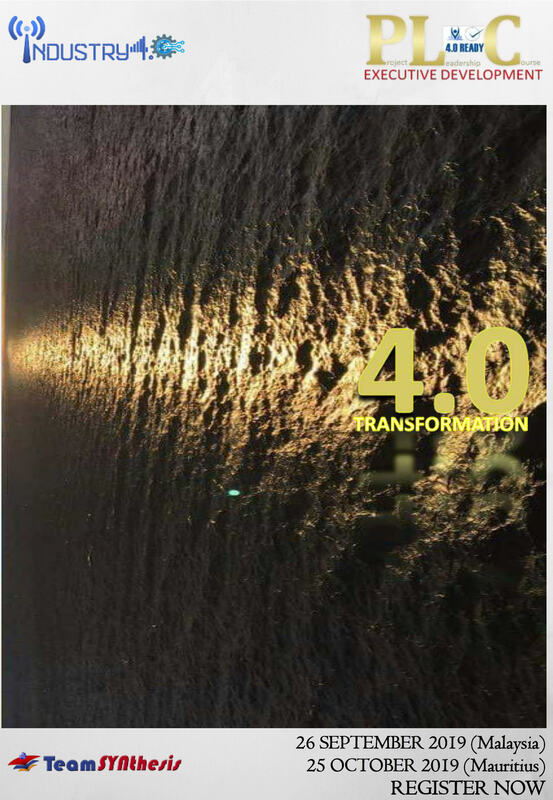 The outcome of this event is for us to instill innovative & collaborative leadership in transforming Good business & operations to Great, an essential pre-requisite in the Malaysian Growth journey. 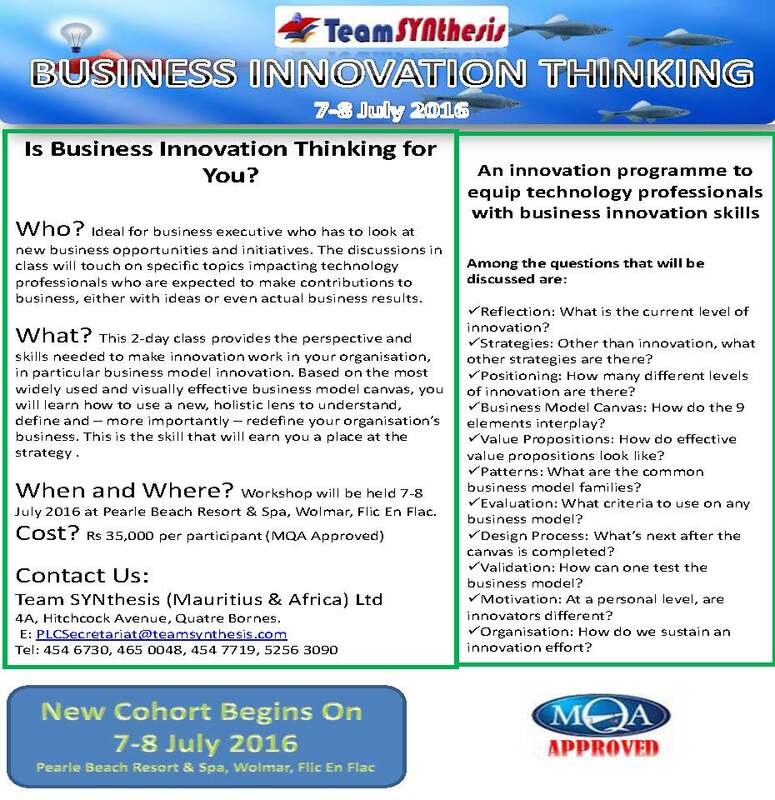 Is Business Innovation Thinking for You? Who? 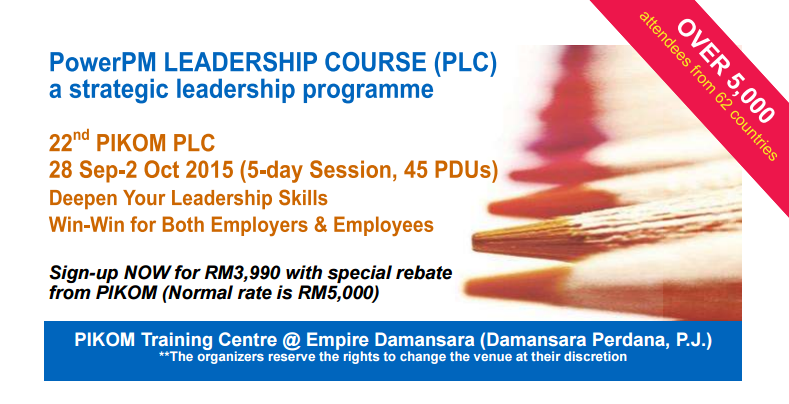 Ideal for business executive who has to look at new business opportunities and initiatives. The discussions in class will touch on specific topics impacting technology professionals who are expected to make contributions to business, either with ideas or even actual business results. 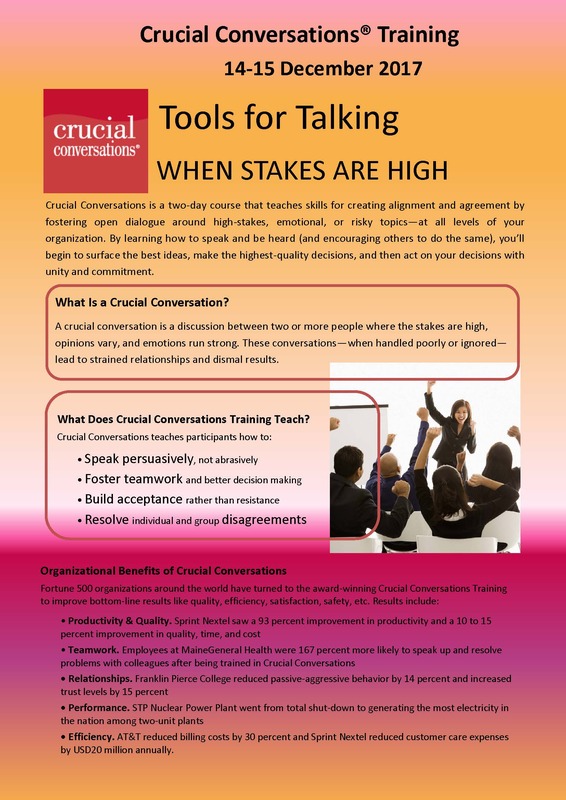 Influencer Training is ideal for teams and organizations looking to overcome profound, persistent, and resistant problems. 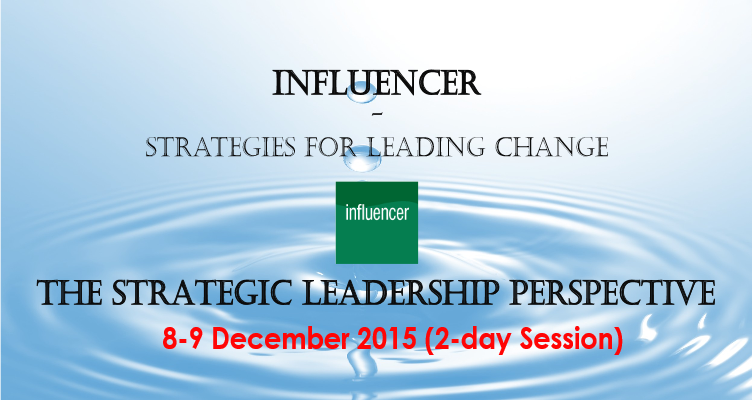 The training provides leaders with the skills to develop an effective and comprehensive influence strategy. 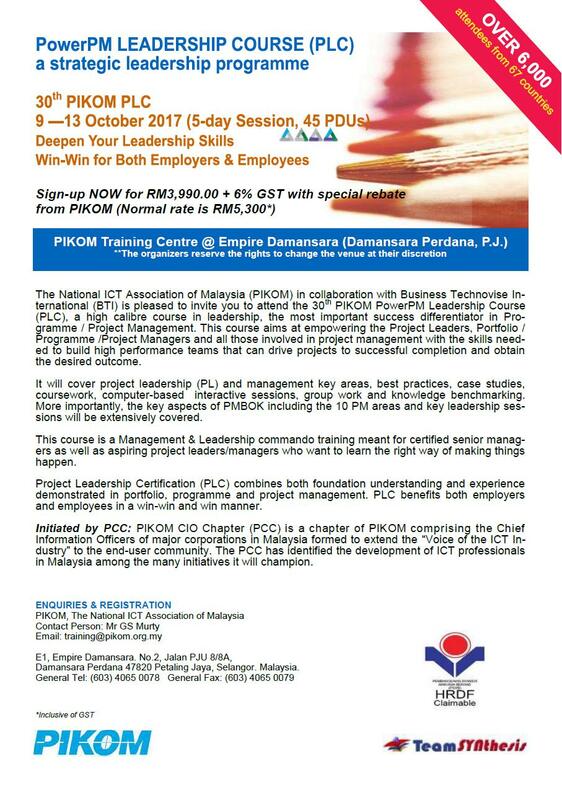 The National ICT Association of Malaysia (PIKOM) in collaboration with Business Technovise In-ternational (BTI) is pleased to invite you to attend the 24th PIKOM PowerPM Leadership Course (PLC), a high calibre course in leadership, the most important success differentiator in Pro-gramme / Project Management. This course aims at empowering the Project Leaders, Portfolio / Programme /Project Managers and all those involved in project management with the skills need-ed to build high performance teams that can drive projects to successful completion and obtain the desired outcome. 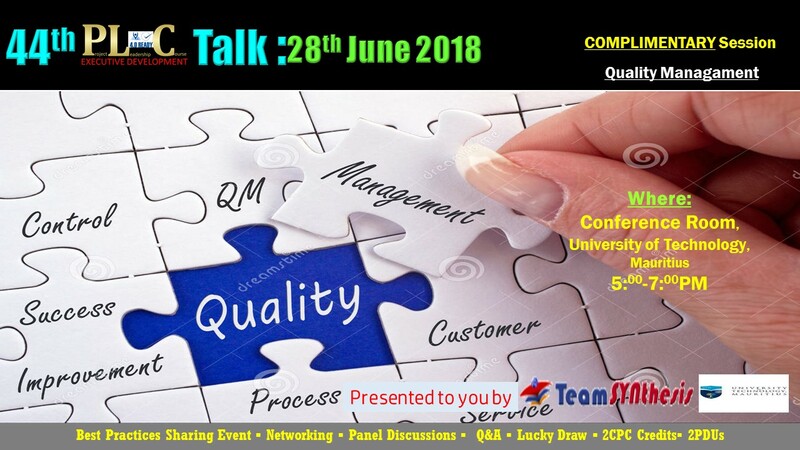 Quality management (QM) is an organization-wide approach to understanding precisely what customers need and consistently delivering accurate solutions within budget, on time and with full process compliance. QM will also ensure the effective design of processes that verify customer needs, plan product life cycle and design, produce and deliver the product or service. Employees are the backbone of any organization . 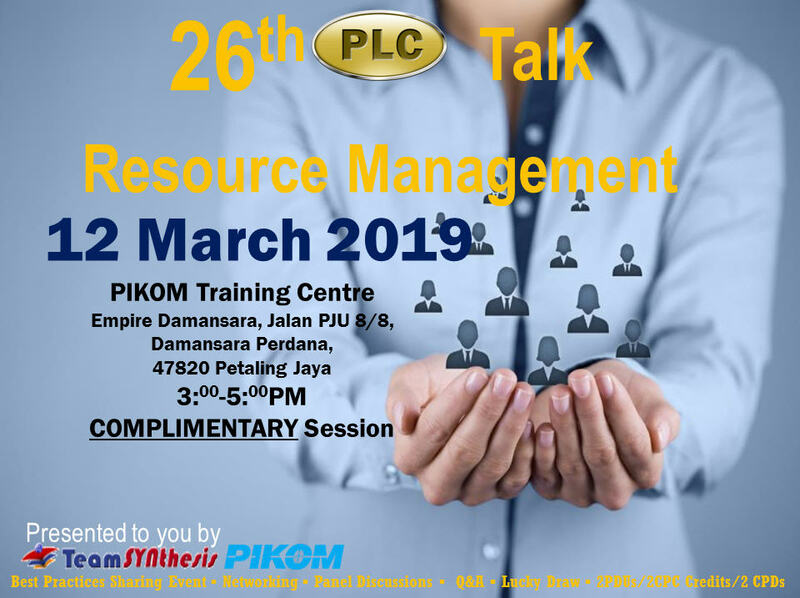 The National ICT Association of Malaysia (PIKOM) in collaboration with Business Technovise In-ternational (BTI) is pleased to invite you to attend the 25th PIKOM PowerPM Leadership Course (PLC), a high calibre course in leadership, the most important success differentiator in Pro-gramme / Project Management. This course aims at empowering the Project Leaders, Portfolio / Programme /Project Managers and all those involved in project management with the skills need-ed to build high performance teams that can drive projects to successful completion and obtain the desired outcome. 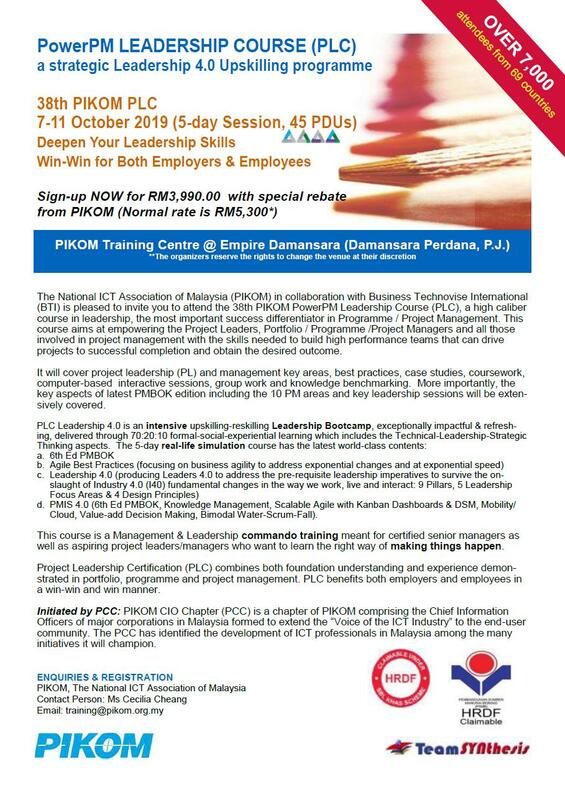 The National ICT Association of Malaysia (PIKOM) in collaboration with Business Technovise In-ternational (BTI) is pleased to invite you to attend the 26th PIKOM PowerPM Leadership Course (PLC), a high calibre course in leadership, the most important success differentiator in Pro-gramme / Project Management. This course aims at empowering the Project Leaders, Portfolio / Programme /Project Managers and all those involved in project management with the skills need-ed to build high performance teams that can drive projects to successful completion and obtain the desired outcome. Holistic lens to understand, define and more importantly redefine your organisation’s business.